Imagine that you had a solar power source that was online nearly 24 hours a day, 7 days a week, was not affected by weather, was not diminished by being filtered through Earth's 60-mile thick atmosphere, and could be quickly redirected to any region on Earth that needed additional power? Does this sound like science fiction to you? At this moment in time, barely a decade into the 21st Century, it is still only a theoretical concept, however space-based solar power generation is more than some far-fetched idea from an impossible Buck Rogers future. It's an idea whose time has come. Because space based solar collectors would be immune to the filtering effects of Earth's atmosphere, orbital collection systems would be approximately 144% more efficient than the best Earth-based solar panels. One of the biggest problems with collecting solar energy on Earth's surface is that it's only possible for 12 hours a day at best. Solar energy collection satellites don't have to deal with the onset of night and are bathed in solar energy 24 hours a day seven days a week for 99% of the year, with only 75 minutes of downtime at night during the spring and fall equinoxes due to being in the Earth's shadow. Another drawback of solar power is that even in regions with optimal conditions, such as the American Southwest, it will inevitably be interrupted by weather conditions: heavy cloud cover, pouring rain, snowstorms, dust storms, and the like. While it's true that some broad-spectrum solar panels are designed to generate electricity from almost all of the different energy wavelengths present in sunlight, weather is still a limiting factor in ground-based solar energy collection systems. The idea of harvesting a limitless supply of solar energy from space certainly has many benefits, but it also presents a large number of technological hurdles that must be overcome. For instance, after the energy is collected, how would it be transmitted back to Earth? Considering the distances involved, the idea of sending the power through wires is ludicrous, so some form of wireless power transmission would have to be used. One way to do this would be using a very powerful, very large microwave transmitter (up to one square kilometer in size) to transmit the power in a tightly focused beam to a collector or rectenna back on Earth. Another idea being floated involves shooting a high-powered laser beam at earth-bound collecting stations for later transmission to earthly power lines. Another tough problem with getting a space-based solar power station working is getting all the necessary hardware into the right location in space. Putting one pound of cargo into orbit aboard the now-defunct space shuttles cost around $6,000. Even going back to the Apollo era of the late-60s and early-70s, when the Saturn V rocket was being used, it still cost around $3,500 per pound to achieve orbit. Newer technologies being developed, such as SpaceX's Falcon 9 rocket, hold the promise of drastically lowered costs for getting payloads into orbit, but at this time, having an economical, reliable launch vehicle is still a major hurdle. 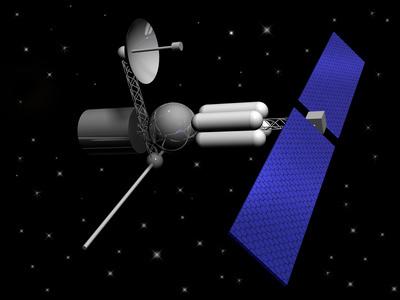 In 1999, NASA's Space Solar Power Exploratory Research and Technology program (SERT) estimated that payload to low-Earth orbit costs would have to be in the $100-$200 per kilogram range in order for a space-based solar collection system to become economically viable. Although NASA scientists studied two methods of converting solar power to electricity: photovoltaic (PV) and solar dynamic (SD), the consensus was the PV conversion was probably the best option. It is currently thought that focused microwave transmission is the best method for transferring power to Earth-based collecting stations. Proof-of-concept tests involving the transmission of tens of thousands of kilowatts via microwaves have already been conducted at the Goldstone Observatory in the mid-70s, at Grand Bassin on Reunion Island in the late-90s, and most recently between a mountain in Maui, and the main island of Hawaii over a distance of 92 miles. The results of this last experiment were presented in 2010 at a special session on "Analysis of Electromagnetic Wireless Systems for Solar Power Transmission", held at the IEEE Symposium on Antennas and Propagation. Laser transmission of power from space has also been considered, but so far the prohibitive costs of such a system have prevented an actual space-based demonstration. Once the solar power collected in space is beamed back via microwave transmission, the energy would most probably be collected on earth using a rectenna a system of multiple dipole antennas connected via diodes. This would collect approximately 85% of the energy transmitted, which is less than what could be collected using a conventional microwave antenna, but the rectenna array has the advantage of being considerably less complex and expensive. A rectenna array would probably have to be several kilometers in size in order to function efficiently, so it would need to be situated in a remote location, where the population density is low. So, on balance there are many difficulties that need to be overcome before a solar power collection system would become feasible, but the promise of limitless power is too enticing to ignore the vast potential of this futuristic concept.